You’re putting so much effort into keeping users on your site and growing the base of loyal customers. But they still come and go or abandon their cart in the last step of the purchasing process. So what are the main reasons for cart abandonment, and what you can do to keep customers on your site? For most visitors it’s easy to leave the site because of anonymity. They can change their mind any time they want, but most of them wouldn’t even think of doing the same in a brick-and-mortar store. The travel sector has one of the highest abandonment rates (81%), this is generally because consumers are not yet ready to book and they just want to do some research (see more in SaleCycle’s infographic). According to Baymard Institute, the average online shopping cart abandonment rate is 68.63% which means that for every 100 potential customers, 68 of them leave without buying anything. That’s too much, don’t you think? No time to read? Get the post as a PDF! 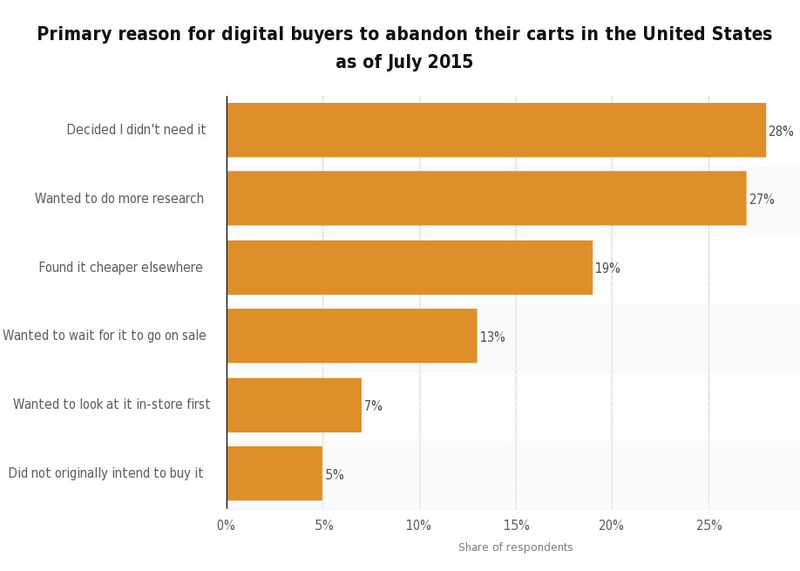 Why Shoppers Abandon Their Cart? There are many reasons why shoppers leave without paying, and the most common (according to Statisa’s metrics) were ‘Decided I didn’t need it’ and ‘Wanted to do more research’, but also ‘Found it cheaper elsewhere’. It shows how online buyers act when they visit an ecommerce store and it’s a chance for you to display a better offer, or incentives to convince customers they need your product. Here in Canada, shopping carts are most often abandoned due to shipping costs. Low flat-rate shipping or free shipping addresses the issue, but most small retailers have to offset the cost through increased product pricing. Take a closer look at the reasons why shoppers abandon their carts and see what you can do to decrease the risk. Give customers a simple buying path with a step-indicator so they can see the progress and know how many more steps there are to complete the purchasing process. Some people who just want to buy one thing (and want to do it quickly), are not satisfied when you force them to sign up. It Works’s research shows that the need to create an account before buying anything is an obstacle for 23% of customers. No one likes to stand in a long queue, so reduce the processing time and make it easier for your customers to pay. One of the best ways is to provide a “guest checkout” option. Collecting customer data via registration helps you manage the communication with them, but not allowing purchases for guests has a direct impact on the number of abandoned carts. To increase the number of registrations, you can highlight a special offer for users who complete the registration process. Don’t forget to make registration quick and simple. Unexpected surprises are great, as long as they are good ones. But, when it comes with an extra cost you can be sure that most users will put off the purchase. If there are any extra charges, show them on the product page and don’t try to hide anything. Keep shipping costs visible on your checkout page, and let customers see that before the payment process. Also, display a preview of the shopping cart with the final price, including the shipping and tax costs, during the checkout to avoid disappointment. One of the best ways to reduce cart abandonment is to reduce undue friction caused by hidden costs. Even if you’re unable to provide free shipping, make sure you’re transparent about shipping and handling charges upfront. Add a shipping calculator to product pages and use clear micro copy filling customers in about shipping costs as soon as they start the checkout process. Don’t surprise them at the end. Even if a customer is determined to buy something he may resign and abandon his shopping cart if the shipping cost is too high. That’s another reason to display all shipping costs on one page before the checkout process. If it’s possible, offer free shipping. It can increase orders even by 90%! If you can’t offer it all of the time, try to provide free shipping week during peak season. This will create a sense of urgency, and bring new customers to your site. Ask Your Target Market’s survey shows that 84% of online shoppers are more likely to buy something when a brand offers free shipping, and almost half of the respondents said that they would be at least somewhat likely to pay a bit more for their overall order if it came with free shipping. When customers see the Coupon Code box, they assume there is a special offer and start to search for it. They might even leave your site to search for the code and there is a big risk that they won’t return. Invalid codes also cause this problem. If you rarely offer coupon codes, you should hide the box. Instead of displaying it for everyone, you could just show the coupon box to your targeted audience. E.g. when they come to your site via promotional email or landing page. I could talk about how shipping costs and delivery times affect cart abandonment rates, but we already know that. The fact is, any time a customer feels unsure, he’s apt to either ditch the purchase or look elsewhere. Knowing that, it’s crucial to keep the checkout clutter free by eliminating distractions like expanded navigation and even ads for related products that may interrupt the process. And don’t shine a spotlight on those coupon fields. Once they leave the site to find a coupon, there is no guarantee they will return. According to Statista, the reason why 36% of consumers abandon their cart is because they find a better price somewhere else. Online shoppers look for the lowest prices. So if your prices aren’t competitive they’ll go buy somewhere else, and probably won’t come back to your shop. I’m not trying to tell you to reduce all of your prices, but you need to consider the competition. Study the market and find out what other retailers offer. If you can’t offer the lowest prices, try a loyalty program with a points system or special discounts. Customers want to be sure that they are getting the best deal out there. So imagine their frustration when they find the same product with a lower price on another website. A price protection guarantee sign on your website is a great customer catcher. It protects them from price drops, and when the price goes down within a certain period, they get a refund. If you’re accepting international orders, you should provide payment options in the customer’s local currency or make it possible to choose their currency from a list. Shoppers from other countries shouldn’t have to wonder what the exchange rate is and how much they will pay. This saves them time. Choose a payment gateway and payment methods that let you sell with the most used currencies. If a customer finds out after the entire purchasing process that he simply can’t pay (because there’s no payment option he uses), he’ll probably click the Close button. 25% U.S. online shoppers abandon their shopping cart because their preferred payment option was not offered. People like to choose, and they have other expectations when it comes to payments. Two of the most popular methods are credit and debit card payments, but you should also think about providing alternatives. Prepare for this kind of visit and highlight an offer they can’t resist. Display limited offers for first-time customers, or add countdowns to build scarcity. Let people save products for later or add a wish list. You can also use the power of retargeting to get them to visit again and increase your chances of making a sale. A strong call-to-action matters, it tells users what they should do. It is especially important in the final step, because this is where customers typically make last-second decisions on whether to buy or abandon the cart. Give customers a clear message in the button and tell them exactly what they should do. Don’t try to complicate it, use Buy Now or Pay instead of Next or Continue. The simpler, the better. Sometimes when you shop online ordered items don’t fit and you need to return them. So customers feel better when the return policy is clear. If they need to pay for return shipping, or if the return process takes too long, they probably won’t buy anything. Offer a step-by-step return process and give your customers a refund option if something goes wrong. It’s a great way to reduce their fears and your business gains credibility. Customers are usually worried about payment security, especially on relatively unknown sites, or when they buy on mobile. They simply don’t want to share their personal information and card details with others, and they understand the risk of fraud. First of all, your website should have high-encryption security certification. Secondly, you should think about outsourcing your payment process to a trusted provider with PCI Compliance. Display a trust mark and security logos in the checkout process in order to improve your customer’s trust and increase sales. You can also improve your credibility by putting testimonials and reviews on your website. Online shoppers like to have options when they choose the delivery method, especially if you sell globally. Be sure you offer worldwide delivery with a various range of pricing. If it’s possible, also offer free shipping to other countries (such as AliExpress, for example). Well all know that the number one reason for shopping cart abandonment is because of high or unexpected shipping rates. To combat this, ecommerce businesses should test a variety of options at checkout. This doesn’t just mean the standard free shipping, flat rate, and carrier-calculated options, but also trying to add more value at the checkout by upgrading the customers shipping automatically, free gift wrapping, or offering free returns. Testing these options each year can ensure you’re delivering the best experience for your customers, while also choosing the best option to run your business profitably. Slow shipping and a lack of shipping options can also be obstacles for customers. Speed of delivery really matters for online shoppers, who are usually impatient and want to receive their order as fast as possible. Make your delivery process as quick as possible. There are, of course, some obstacles over which you have no control, but do everything you can to provide the fastest delivery options available for your customers. When visitors on your site can’t find any information about your products, they usually go away and never come back. Highlight essential information on the product sites, and add a chat widget on your website to solve customer’s problems in real-time. This helps you to identify the moment when a customer wants to abandon their cart and allows you to show them the chat window, so you can help them instead. You can also display a special offer by analyzing mouse movements (e.g. with Picreel) in the shopping cart. When you see that a customer is going to leave, display the pop-up with an offer he can’t resist. It’s important for customers to feel comfortable enough to purchase. This is not only about security issues, but also good customer support. Keep a contact section visible throughout your website to make it easy for customers to ask you questions. Add a live chat, and if possible, be ready to answer 24/7. When you need another size or can’t find the shirt in your favorite color in a brick and mortar shop, you just simply go and ask the staff for help. But what about when there is no one to give you a hand? You probably leave the store. This is the same with online buyers. Make it easy for people to find contact details on your website. Be clear, leave a phone number, or put a live chat on your website to help people quickly contact you. This is especially important when there are only a few hours left to end a promotion. Online users are usually impatient and don’t like waiting too long, just like nobody likes to stand in a long line. Optimize the website and improve the loading speed. Get rid of any unnecessary elements on your page. Online shopping needs to be a hassle-free and smooth process. Confusing navigation comes with customer frustration and may lead to cart abandonment. Make sure your website is easy to navigate, with a clear call to action and other important elements without any distractions. Show the cart summary on all pages and make it easy to complete checkout process. Make sure customers are not distracted when it comes to clicking the Buy/Pay button, and disable pop-ups. Save customers time and they’ll love you for it. More and more people are tending to browse on their mobile devices, even if they buy on desktop. Research shows that just 14% of customers using smartphones buy on mobile devices. And one of the reasons is poor usability. Create a website with a responsive design and let your customers buy on any device they want. Provide the best mobile experience and minimize the number of form fields. You may not think of this as a reason for cart abandonment, but you need to remember that the shopping experience on desktop is much different than it is on mobile. Whereas you can use extra information, pop-ups, and others on desktop – it’s not a good idea to use them on mobile. Give your customers a well-designed checkout page, without tiny buttons or unexpected fields and information. Match the checkout with your site’s look and feel. Test your website and payment process flow before the launch, and increase your ecommerce conversion rate by improving payment usability. Reviews help customers to make purchasing decisions, they help customers to know if the product is suitable for them or not. According to PeopleClaim, 63% of consumers are more likely to buy from a site that has reviews and product ratings. Add reviews to your ecommerce website and let users write their opinion and/or rate the product. Remember that sometimes people want to change the size or color of their selected product, or add more items before they push the Buy button. What if they can’t find the edit option? Your customers want to easily update the cart and the items in it, so give it to them. Make it possible to preview items, cost, shipping fees and others before the checkout. You can also add an option to simply remove the product without leaving the cart. Sometimes when customers spend a lot of time on your site and add some items to the cart in the meantime, they don’t remember which items they chose. Display the item photos in shopping cart to show customers the products they chose. They need to be sure that they are actually buying the product(s) that they selected, so also give them the product’s information, e.g. color and size. Visitors should see their cart on every page and have the possibility to simply go to the shopping cart page with a click. Provide the cart summary throughout the whole checkout process. Show it from the beginning, not just at the last step. The more links on the checkout site, the bigger the chance that you’ll lose the customer before he reaches the checkout page. Avoid displaying links that take customers away and have no meaning for the purchasing process. Also, monitor customer’s behavior when they click on related products. These can also bother the buying process because customers often click on products and never return the cart. People sometimes make mistakes when filling in forms, and they have to know what they did wrong. They need clear messages, otherwise they won’t complete the checkout process. Display clear error indicators and tell customers exactly what’s wrong, and what should be entered in. Sometimes people don’t complete the purchasing process because of not having enough knowledge about the product. It’s hard for them to guess why one item is better than another. Provide a comparison tool that allows customers to place similar products next to each other. People are more willing to buy when they have more information about the product. Traffic on ecommerce sites (on desktops as well as on mobile) is still increasing, but people need more incentives to buy. 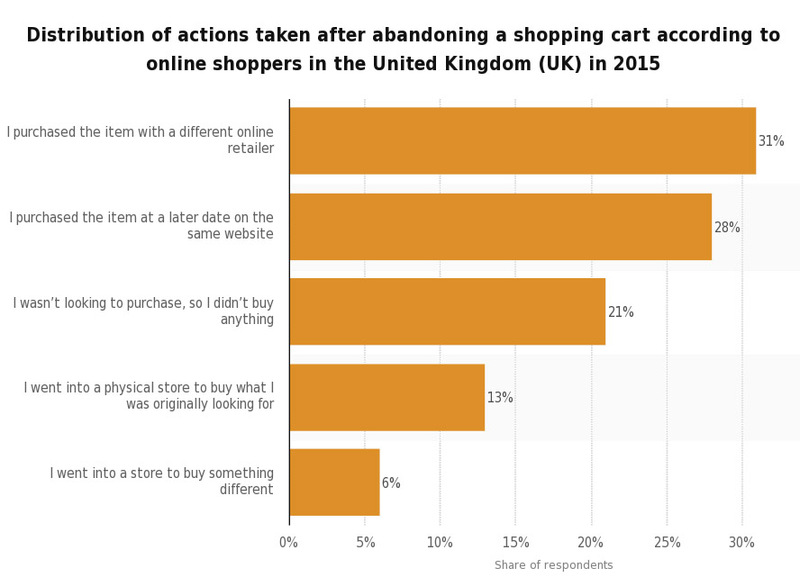 See what actions are taken by online shoppers after abandoning a shopping cart. For online store owners there is nothing worse than a customer who just browses, adds an item to the cart, and then goes away. Sometimes buyers just resign, even though you did everything right. But, you need to understand that it’s a normal behavior of online shoppers. The good news is that you are sometimes able to convince them to go back to you and close the deal. There are many reasons why people abandon a cart, and not all are due to issues caused by poor UX. For example, many people create baskets during the research phase of the buying cycle, so they’re not ready to commit to purchase. They may want compare prices for a shopping list with other retailers, or they might want to park items and wait for sales to see how much they can save. There are lots of UX reasons that force people to abandon. These include unexpected delivery charges added to the order total, or slow loading pages on mobiles that frustrate users. UX issues can be avoided by regular testing and optimisation, using web analytics and CRO techniques. What can website owners do? Make sure they’re looking at the data in sufficient detail to know when there’s a problem and then find out what’s causing it. This requires a blend of web analytics data and voice of customer data, such as usability studies and surveys. Also don’t ignore your customer service team, which is usually a treasure trove of customer insight and anecdotal feedback. You should also consider retargeting for abandoned baskets, such as exit intent overlays and emails. But think it through carefully and don’t jump in with discounts – you may sacrifice margin unnecessarily. Smart retargeting focuses on service and trying to learn why people abandon, so the campaigns are tailored to user needs rather than simply offering pricing incentives. How can you know what elements in your checkout process give the worst results? Use A/B testing – make another version of your checkout and monitor the analytics. Remember to test one element at a time, otherwise, you won’t know what works and what doesn’t. Also, use some applications, such as Hotjar to find out how your customers behave based on the movements of their cursor. What other tools can you use? Loyalty Bay lets you offer customers a number of options when they are about to abandon their cart or leave the site. With this tool you can offer discounts, 3rd party rewards or your own content. Picreel helps you convert abandoning visitors into leads by analyzing their overall mouse movement. When a user is just about to leave the page, the tool triggers an event to stop them. You can use ready-made templates, or create your own offers. This tool works in a similar way as Loyalty Bay and Picreel. It tracks your visitor’s behavior and when they are ready to leave the site, OptiMonk displays a targeted offer. With this tool you can schedule and send automatically triggered messages, and also segment customers based on their behavior. It lets you see the analytics and track your ecommerce performance for better optimization. To start, you need to add a single snippet of code to your site. Rejoiner is a great tool to automate remarketing email campaigns. You can use it to follow up with customers in real time or schedule personalized email sequences to cart abandoners. UpSellit was made to recover abandoned carts not only with on-site marketing and remarketing emails, but also with automated chat. It comes with full customization and it also provides the metrics marketers needs to analyze visitor behavior and optimize marketing efforts. SaleCycle, as well as tools mentioned above, helps you identify and reach users who leave your website. It comes with on-site marketing, email features, and SMS remarketing. There are many reasons why online shoppers abandon their carts, and you should be prepared for this. Unfinished purchases don’t mean that the sale is lost. Now it’s up to you to convince the potential customer to come back and complete the process. Use one of the marketing automation tools to re-engage visitors (see what you can do to write better abandonment cart emails). Keep in mind that personalized messages increase the chances to bring customers back again and buy some products on your website. Do you have anything to add? Let me know in the comments section. 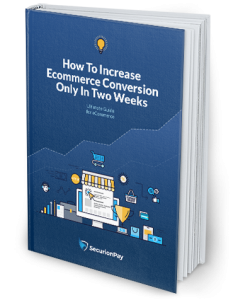 How To Increase eCommerce Conversion Rate Only In Two Weeks?